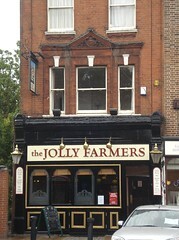 A nice, traditional pub in Lewisham, previously known as the Jordan. It's about 15-20 minutes' walk from Lewisham station (zone 2), and about 5 from Ladywell (zone 3). It has a beer garden, a quiz machine, and five handpumps. They have a selection of good wines as well, and in general this pub is much better than the nearby Fox & Firkin for quality of drinks (it's just more expensive) and is also a fair bit quieter. Kake, Ewan, secretlondon, her welshness, and James visited on a Friday evening in October 2008. Four of the five handpumps were on, offering Young's Ordinary and Special, Doom Bar (£2.80/pint), and Archers Golden. Kake had no trouble finding a table on arrival a little after 6pm, though most if not all of the seats in the pub were taken by the time we left around 8pm. When bob visited in October 2009, a pint of Young's Ordinary was £2.60. The decor is perhaps a little sparse, with large bare wooden tables, and it was quite well-lit on our evening visit, but it doesn't feel unwelcoming, and its small size means it still feels fairly cosy. As of October 2009, food is served noon-2:30pm (not sure which days) and quiz night is Wednesday. There used to be comfy sofas — were these still there on our most recent visit? Kake didn't notice any. Expect to find off-duty doctors and nurses in here, as it's right next door to a university hospital. Last visited by bob, October 2009. Last edited 2011-06-26 14:24:27 (version 25; diff). List all versions. Page last edited 2011-06-26 14:24:27 (version 25).